Founder of End Time Ministries, Irvin Baxter has a surprising amount of unconventional yet solid interpretations of Bible Prophecy, such as the meaning of the Four Horsemen of the Apocalypse, America in Bible prophecy, and the timing of the rapture. 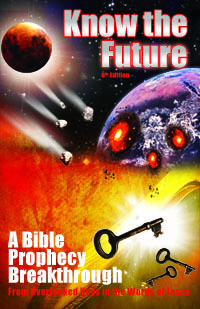 Irvin Baxter is known for his EndTime.com website and daily radio show on prophecy called Politics and Religion (It is available archived as mp3 at his website below). I listened to Irvin's radio show for a number of years and discovered several gems among his prophecy teachings. For example, he says that the Four Horsemen of the Apocalypse are already riding having inspired Catholicism, Communism, Capitalism and Islam. I disagree with the last one (rolling it into the 2nd one) but three out of four is not bad. Irvin is also unconventional among prophecy teacher broadcasters in that he holds a post-tribulation rapture position and he even touches on Wormwood in his teaching (like myself). While he bases his rapture position on looking at the rapture and resurrection texts (like Rev 20:5) literally, his teaching on Wormwood unfortunately is allegorical, turning a "star burning like a torch" (Rev 8:10-11) into the Chernobyl disaster of 1986. In conclusion, even though I'm not Pentecostal (or of any denomination), I like Irvin a lot and how he thinks on Bible prophecy. If you have a chance to listen to his radio show, you will find more than the typical number of verifiable interpretations of Bible prophecy.